My name is Sitharaam Jayakumar and my friends call me Jai. I started blogging just a year back. I started my blog with the idea of posting poems. Over a period of time I started writing articles and soon I added some photography too. Now my blog is a hotch-potch of several types of posts. 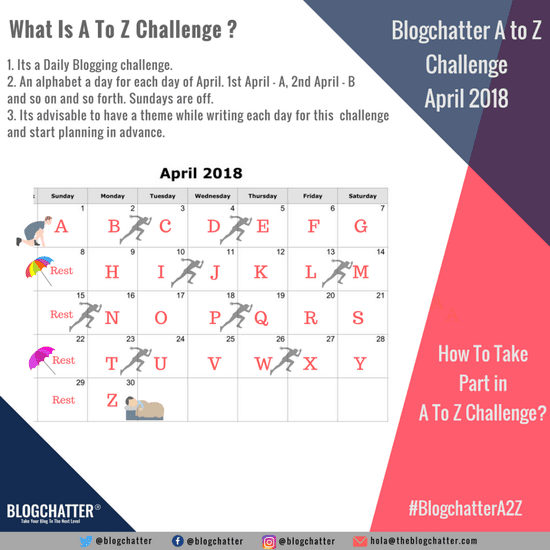 But last month I heard of the A to Z blogging challenge conducted by Blogchatter in the month of April. I thought to myself, maybe this is the opportunity to introduce something new to my blog. The one thing that was missing was a fictional story. So I decided I would write a thriller stretching across 26 posts, each post with a title and content related to a specific alphabet of the English language. But please note that it will be one complete story. So here are the titles of the 26 chapters. This story is a work of fiction and all the characters are entirely imaginary. Any resemblance to people living or dead is purely accidental. Here is to hoping that all of you visit this blog in the month of April and read the posts and enjoy them. Thanks Shipra, Looking forward to reading your posts too. Look forward to your comments in April. 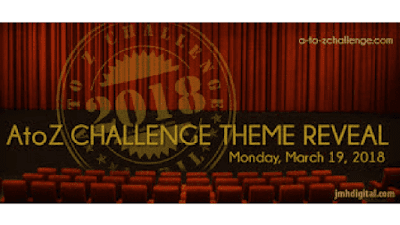 Thanks so much for visiting my theme reveal. Really curious to know how these characters will be revealed, Jai. All the best. You have a reader already. I have tried to weave a good story around the titles Varsh. Hope you enjoy it. wow! Looks like you are super organised already! Will be watching this space for more. Good luck! Thanks Lavanya. Looking forward to some very good posts from you too. Thanks Miss Andi. Looking forward to reading your posts too. This is really interesting I'm waiting to read the stories. Thanks Sonia, I hope I am able to come up with something satisfactory. This is my first attempt at a short story. Thanks Sonia. Hope my posts in April come up to expectations. Looks interesting. I love fiction and this is gonna be amazing. Waiting for your posts in April. Thanks Sushma, I will look into your theme reveal soon. This is really impressive that you've got titles ready too. I started writing some fiction recently for a challenge and found it so incredibly satisfying. and challenging: all in 100- 150 words. good luck with #AtoZ Im looking forward to reading more of your stories. Thank you. Yes I am partly ready but still toying around with the plot and how I should proceed forward. Looking forward to your posts too. What a fabulous set of titles! Looking forward for some thrill and mystery.. Thanks for visiting Namratha. Hope I am able to come up with something satisfactory. Well I look forward to reading your posts in the challenge too. I saw your theme reveal and I was indeed impressed by your theme. The titles look promising. I would definitely love to read this thriller. And just like you, my blog lacked a fiction too. And I am doing one this April to fill that void! Wow ! Quiet a few people doing fiction in April. I look forward to reading your posts. Wow! It looks all planned out and a thriller series of 26 posts. It's going to be a nail biting month throughout here then! Looking forward to read through your fictions. Best wishes Jai. Thanks Shweta. I will be visiting your theme reveals soon. I am a bit busy this week and I am not able to catch up with blogging. I hope what I come up with is enjoyable. Looking forward to your visits and comments in April. This is super interesting, Jai! I look forward to reading your posts. Thanks Rohan, I look forward to reading your posts too. Thanks Dishki, Just a few days to go. I look forward to your posts too. Wish you the best of luck !